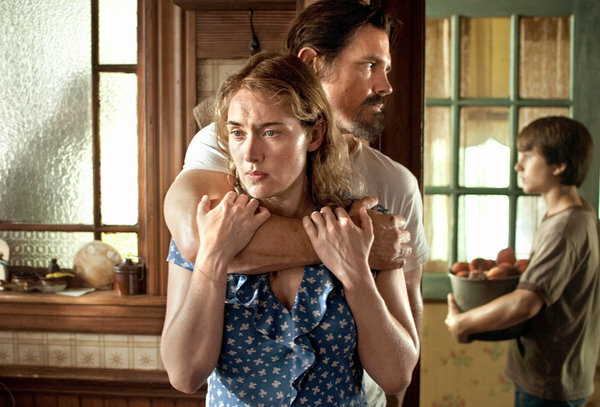 Is Josh Brolin giving Kate Winslet a hug or a chokehold? In “Labor Day” they are one and the same. Jason Reitman showed an amazing degree of emotional acuity with his first three movies: Thank You for Smoking (2005), Juno (2007), and Up In the Air (2009); sadly, every single bit of that seems to have evaporated with his screen adaptation of Joyce Maynard’s 2009 novel Labor Day. As hokey and tone-deaf as it is implausible, this sloppy romance drama makes for one long, hard slog. It’s anyone’s guess as to why Reitman would choose to adapt such a ridiculous and downright creepy story: Set on Labor Day weekend in 1987, it’s told from the point of view of 12-year-old Henry (Gattlin Griffith). He’s a boy on the cusp of those awkward teenage years who lives with his deeply depressed and borderline agoraphobic single mother, Adele (Kate Winslet), who hasn’t been the same since her husband (Clark Gregg) left her. Things change drastically for both of them when they are take kinda sort-of captive by Frank (Josh Brolin), a misunderstood escaped convict with an even more tragic back story. (Sure, he killed somebody, but it was an accident and they had coming, so it’s okay to like him.) He ties them up, cooks them dinner, and by the next day he’s tuning the car, fixing up the house, baking pies, and playing catch with Henry. all while Tobey Maguire narrates with a thick layer of nostalgia as the adult Henry. Faster than you can say “Stockholm syndrome”, the deeply, pathetically lonely Adele is besotted with Frank, and by Monday they’re planning to run away to Canada. This sort of thing worked for Pedro Almodóvar in Tie Me Up!, Tie Me Down because he had the sense and good taste to play it as a farce. Labor Day would have made an excellent parody of Lifetime Channel fare or daytime TV fodder (“Escaped Cons and the Hostages Who Love Them!”) if Reitman had the sense to do the same; instead, he plays it completely devoid of irony and gives us a silly, sentimental, and just plain queasy romance that goes out of its way to be safe with material that is anything but.